I have a love affair with high necks and I heart the pearly detail. I do think £45 is a tad excessive as it is made of jersey material but it would just look so cute with a high waisted skirt, heels and a big bun. I have been doing my last bits of Christmas shopping this week and it is in every Topshop window, and right at the front of every store. It's taunting me! They only have size 16s left online but I definitely cannot afford it until pay day which is 10 days away, so I'm just really hoping it doesn't completely sell out. That is really pretty. Here's hoping it's still there when pay day rolls around! Such a gorgeous top! <3 <3 <3 I love the pearl detail! I love how classic it looks, the neckline is gorgeous! Yeah I often find Topshop/Topman a tad expensive, it's probably because of all the hardware that's on it rather than the fabric it's made from. It is super cute though, is it cropped? Love this style of top.. If it's cropped I like wearing tops over midi dresses at the moment. 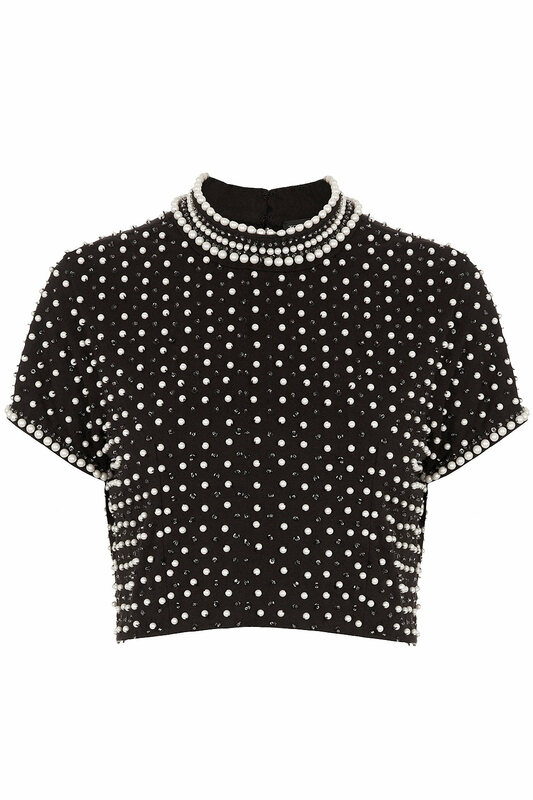 I will also be on the hunt for it if it ever returns to Topshop! !